Kevin Burch, president of Jet Express Inc. and co-chairman of Trucking Moves America Forward, said the nonprofit group also installed 184 wraps on truck trailers — moving billboards promoting the industry to millions of highway motorists. The group will celebrate its fourth anniversary at the Mid-America Trucking Show in Louisville, Ky., later this month where the mascot, Sammy Safety, will make his MATS debut. 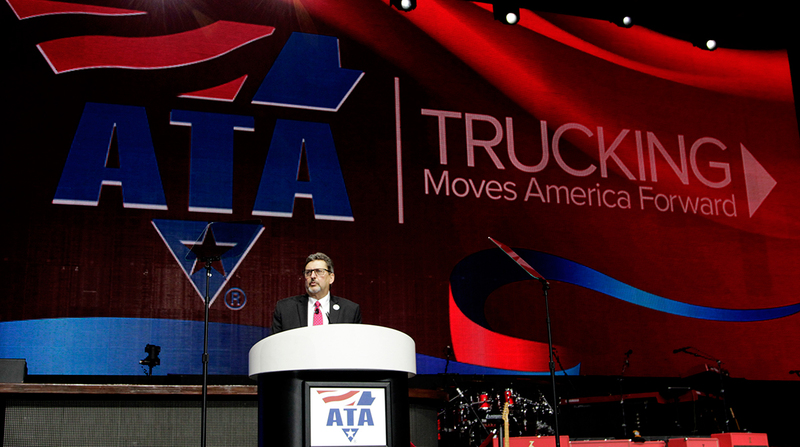 Over the four-year period, the group has raised more than $4 million in donations, said Elisabeth Barna, chief operating officer of American Trucking Associations and a member of the group’s executive committee. In 2017, the image campaign generated 17.4 million billboard impressions and 26.6 million radio listeners during National Truck Driver Appreciation Week and placed 54 earned media stories and 13 op-eds in national, Washington and local publications that led to 83.9 million total media impressions. The group grew its email database to 3,517 subscribers, expanded its social media presence to more than 13,500 followers on Facebook and more than 3,600 followers on Twitter and recorded 100% growth on Instagram. The promotional campaign also launched its blog through Medium Corp. to enlist industry authors and writers to share their personal stories, and reached a potential in-person audience of more than 170,000 at trade shows and other events. Steve Ponder, executive vice president of Great West Casualty Co. and co-chairman of the image campaign, said the group offers free resources to all members of the trucking industry to tell trucking’s story, including executives, drivers, technicians, vendors, suppliers and state trucking associations.